The 2018 MiniEuros are drawing closer by the week and excitement levels at the Minifootball Association of Ireland are at an all time high. 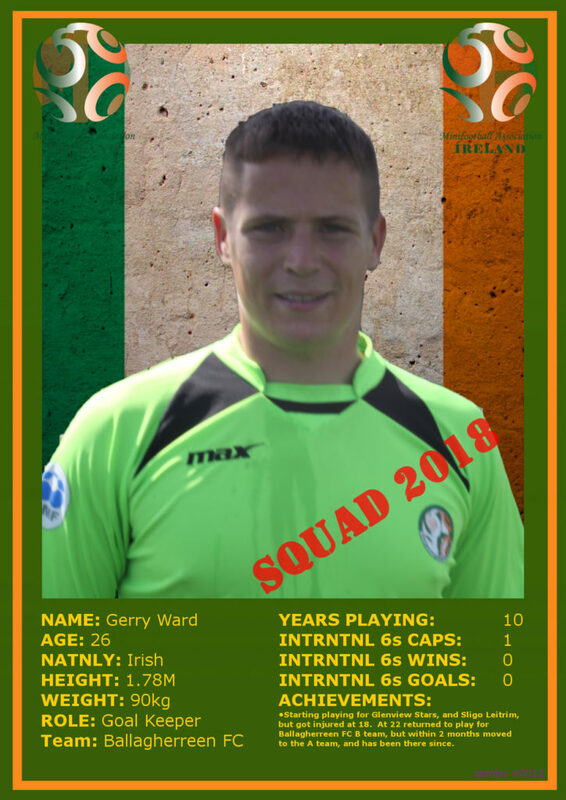 The governing body for 6 a side soccer in Ireland want to introduce you to the finer details of the sport, and of course, the 2018 national squad. Knowing the players, and the game will make it much easier to follow and support the team in Kiev next month. Have you missed out on the start of our minifootball series? 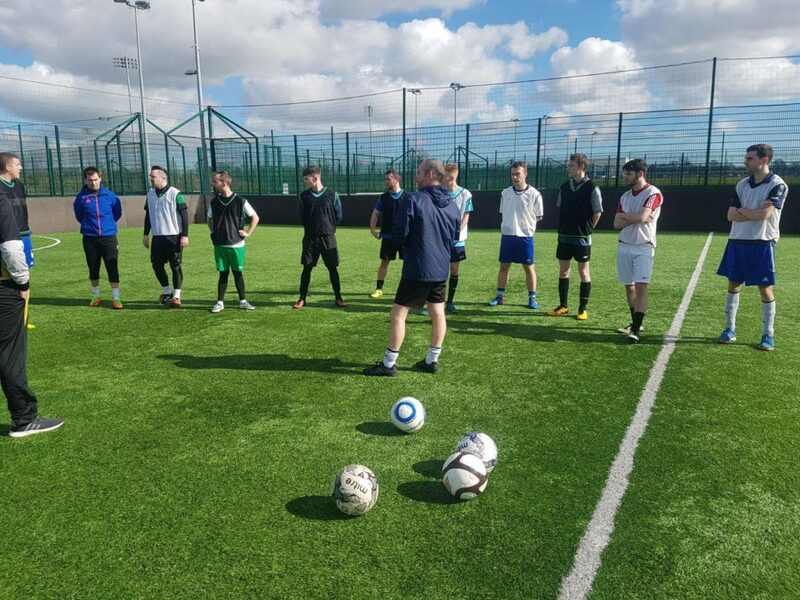 Then we would recommend checking out Part 1 on Where It All Began, covering the growth of minifootball in Ireland, the challenges involved and the costs of success. You can also find out more about the coaches in Part 2 on the MAI Management Team. ‘Official’ Minifootball is played on a grass, or astro turf pitch, similar, but smaller in scale to 11 a side soccer. The pitch is on average 28 metres wide, by 48 metres long, with a 4m x 2m goal at each end. Most rules are the same as 11 a side soccer, with corner kicks, throw ins, tip offs, 2 halves, keepers boxes and size 5 soccer balls. The local house rules one would see at some venues are removed, reducing the complexity of the game. So, for instance, there are no boards at the sides, no head height restrictions and the keeper can leave the box. 6 on 6 – A team will have 6 players on the pitch, and a subs bench with approximately 6 players on it, limited only by each specific tournament’s local rules. These players can change at ANY time, and as often as they want, once it is from the centre of the pitch, and at no time does a team have 7 players on the pitch. Referees – Local games generally run with 1 referee, competition rules typically see 2 referees on the pitch. One will be placed on each side of the pitch, acting as linesman for that side, each of which can equally make a call for an offence. Although one referee will have the right to overrule the other, to ensure that a game continues with as little disruption as possible. 3rd Official – There can also be a third official responsible for the time keeping, offence logging, player replacement procedures and scores. There is always a fourth official at international events, This is to control the substitutions, balls and other general duties, ensuring the fluidity, safety and accuracy of each game at international level. Bookings – Although competitions vary, in general a yellow card means that a player will leave the field for 5 minutes, with no player allowed to take his place. Two yellow cards in one game, or a red card, will result in that player being removed for the whole duration of the game. Fly Keeper – An unusual situation for many, but common for futsal players, is the ‘fly keeper’. Typically introduced by a team that is losing in order to gain an attacking advantage. The losing team will remove the keeper, and put on an attacking player that can still carry out the role of the keeper. This player must wear their own number and be in a distinctive shirt like their teams away jersey. Sub System – Unfortunately with the rolling sub system, this situation has been abused over the past years with teams switching keeper with striker constantly when the phase of the game changes from attack to defence, which has ruined the concept to the allowance of the fly keeper. The MAI plans to tackle this ruling over the coming few years to create a fairer outcome. 2 Halves – Last but not least, each match is run with two 25 minute halves. Tune into the event in Kiev and we’re sure that you’ll spot a few more unusual traits that the sport has. 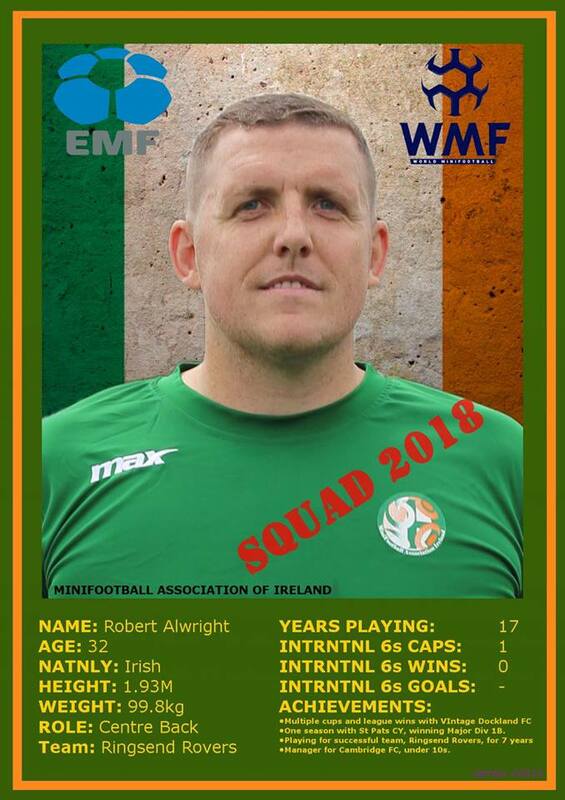 Last week the 2018 Irish 6s panel was announced just before they played the first game of official minifootball ever to be held on Irish soil, at the National Sports Campus in Abbotstown. It was a special time for the sport, with England contesting the first ever Anglo Celtic Cup. You can watch the match in full in the video below. The newly formed Irish squad all got the opportunity to play out. With only 5 minutes to go in the game, they were holding their own, leading the game 4 to 3. But it was not to be, as the experience of the opposition kicked in. The English managed to score 4 goals in as many minutes, taking the final score to 7-4. The panel performed well, and it was therefore agreed to take the whole panel, as the playing squad to Kiev for the MiniEuros. We thought it only right to introduce you to these players, so you know their background. With the MAI producing ‘Panini’ style collectors cards for the team, we can give you a first hand snapshot of the players to celebrate their achievements to date. Involved from the first trial, and standing out as the 1st team keeper for the national team, John is also first keeper for futsal team Saints and Scholars. With a mass of experience, including international futsal duties against France, Norway, Finland, Israel and Andorra, this experience rightly earned him the captaincy of the team for the game against England. Will he manage to hold onto that title? 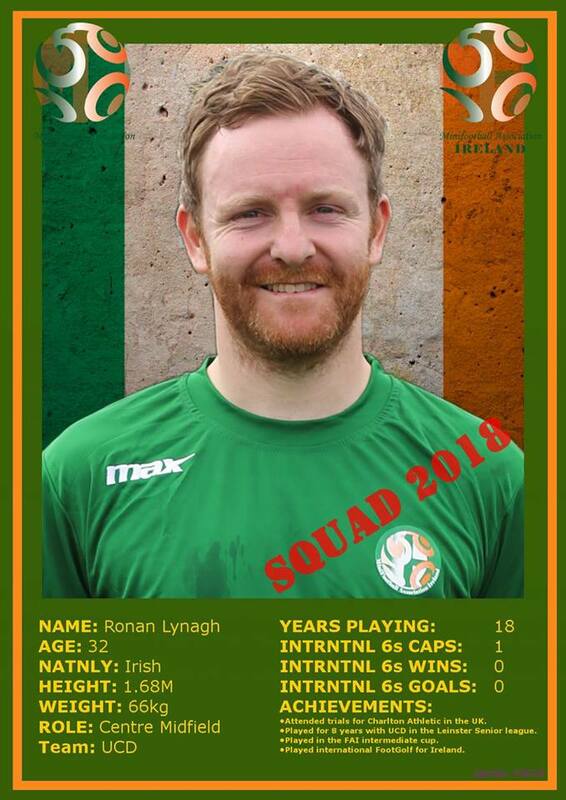 A new player to 6s, Caoimhín has impressed the management team enough for him to travel with the squad to Kiev. He has a lot to fight for, but has already proven to the team that he has what it takes. This guy has made massive improvements in his skills and abilities over the summer training sessions. Definitely one to watch for the future. James is a strong, consistent and experience defender, who has played with the defence forces against Germany in European Championships in 2012. He also played against Kazakhstan, Croatia and Italy in the 2014 MiniEuros, giving him the added experience to share with the newer players of the squad who have not experienced. James plans to go back and improve on the 2014 performance. Bob, an experienced player from the very successful Ringsend Rovers, is a wall in defence, but most importantly, a strong and respected leader on the team. He brings a wealth of seniority and experience to the squad, that shows when he is involved in any game. 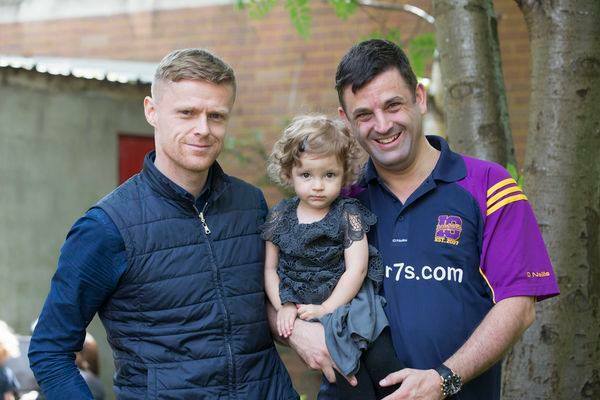 Not to be messed with, this rock is going to be key to the Irish team’s defence in Kiev. 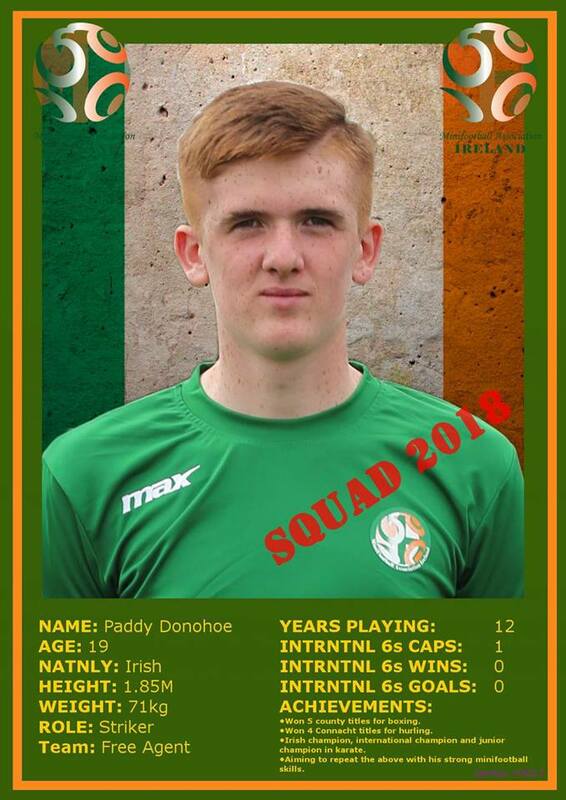 Scouted from a tournament in Galway, Paddy has impressed all with his touch and skill. Four times player of the year with Galway Town, he is surprisingly not currently playing weekly soccer. However, his improvements and maturity over the past 2 months have been noticed, and we are sure that that will change over the summer. Paddy is certainly one to watch for the future, at 19 he is only heading towards his peak. Ian is clearly a very influential player on the team. 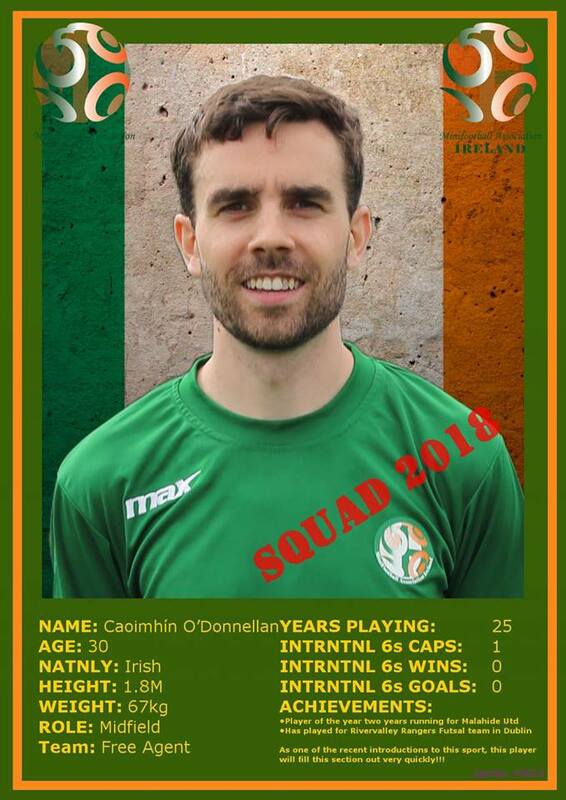 Also one of the most experienced tactical players there with 4 minifootball caps, international UEFA futsal experience and a reputation as one of the best futsal players in Ireland. 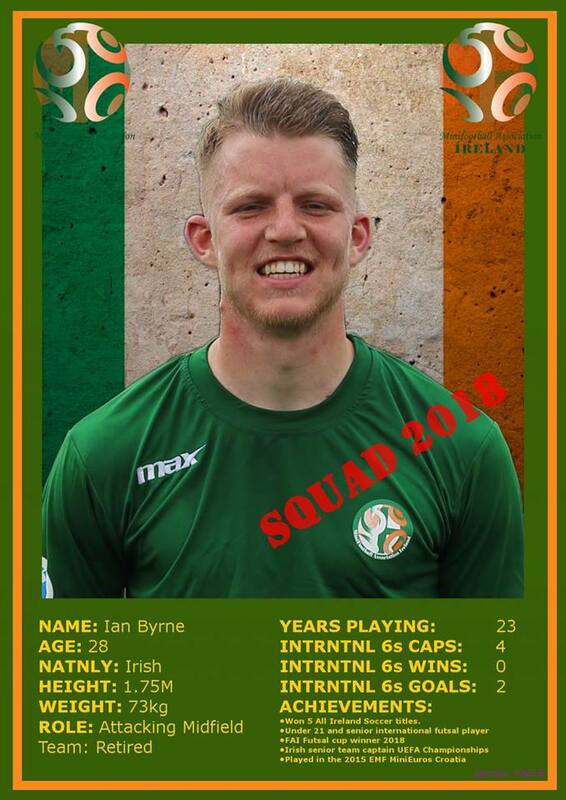 Ian’s influence on the team is clear, and with the added experience he has had from playing in the MiniEuros in Croatia, he has a lot to offer for this campaign. Ronan who has played for UCD, and also played in the finals of the FAI intermediate cup, has a great ability to change defence into attack in a split second. 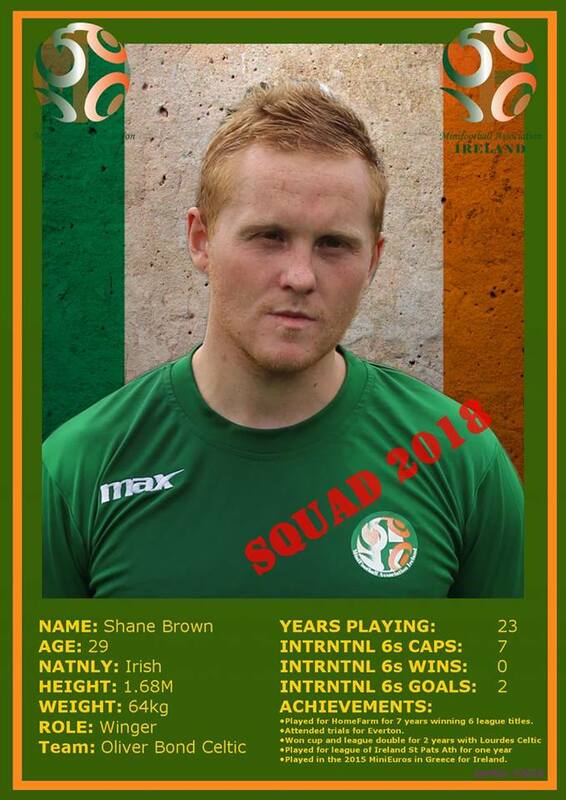 Who knows, but his involvement playing international FootGolf for Ireland, may also give him an interesting advantage on other players in Kiev! 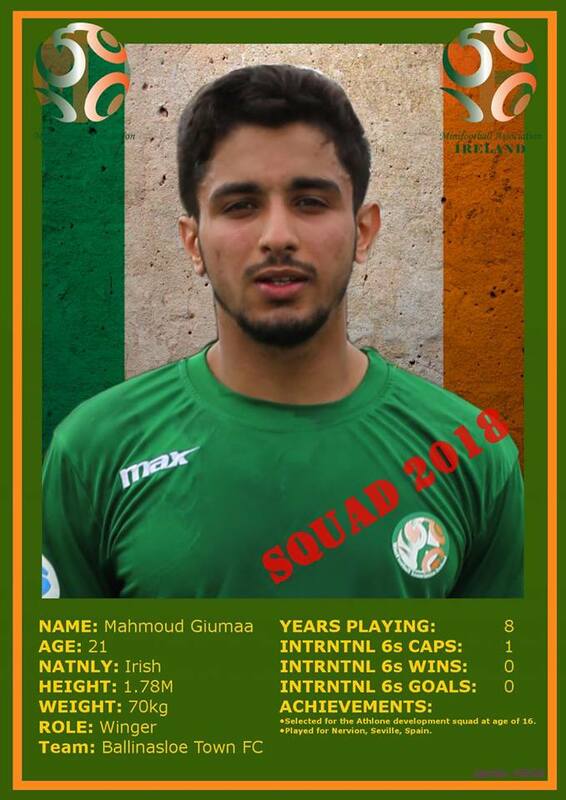 Mahmoud is a fast striker for Ballinaloe Town FC, with enough energy to run all day. With a sharp and accurate pass, and a quick turning pace, he is one that will make the other teams worry. This young man is very comfortable in front of goal and has high aspirations to end up on the score card in Kiev. A key player for futsal team Saints and scholars, Emir has passed through Germany, St Francis FC and St Patricks Athletic. He has picked up a wealth of experience that he is sharing with the younger players in the team. Emir has great leadership qualities, and is one that the younger players rightfully look up to making him an invaluable asset to the team. 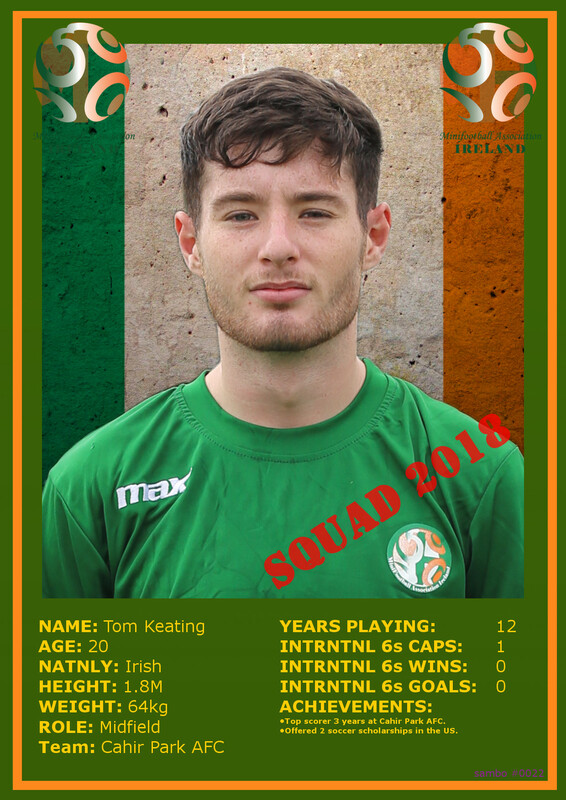 Tom is top scorer for Cahir Park FC, three years running, and somebody that turned down 2 playing scholarships to the US. At only 20, we expect a lot from him in the future, but what is it he has up his sleeve for Kiev? A scoring midfielder is every teams nightmare! 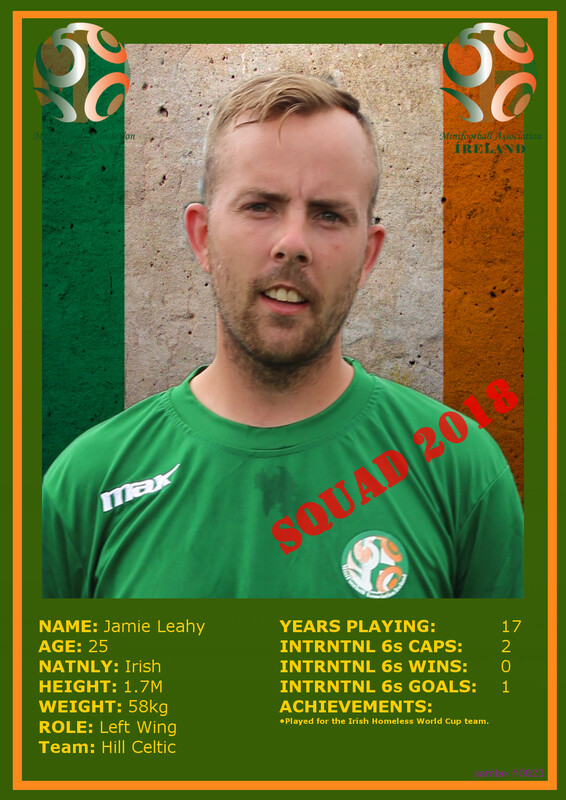 With caps already for playing with the Homeless World Cup team, and an eye for a great pass, Jamie is a player that has developed well over the summer, and will be looking to add to his international goal tally as soon as possible. 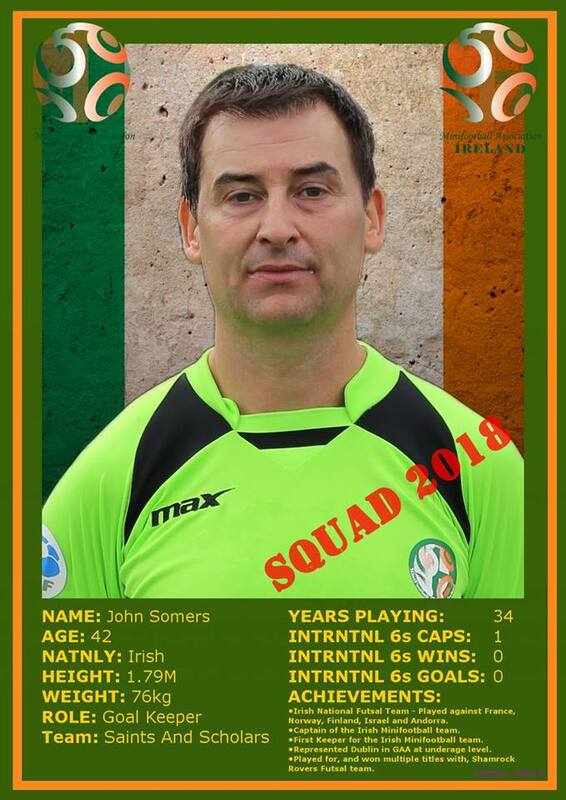 Although listed as the second keeper for the Irish team, both he and John Somers act as one, and provide the Irish team with a strong influence between the posts. By no means a second keeper, he is on his way to competing directly for first keeper spot, keeping both players in tip top condition for Kiev. 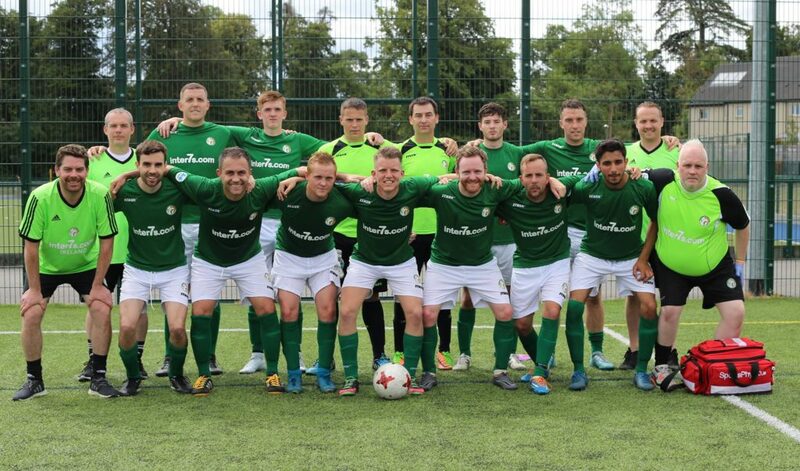 So there you have it, the team that will shape minifootball in Ireland for the years to come. Some senior players with experience, and some younger players that are performing well, yet still with a lot more potential. We also have a further group of players that have recently signed up to training. We expect many more to come when they see the experience and success that the current squad will enjoy. Role on Kiev, and role on success for Ireland at 5, 6 and 7 a side minifootball internationally. Should you be interested in playing for, sponsoring, or supporting the team, please contact info@maireland.com, and ‘Make Maireland, Your Ireland’. Don’t forget to join us for our fourth and final part of the series when we will look at the top teams to watch out for in the tournament, the schedule of play and what’s next for the Irish squad after Kiev. 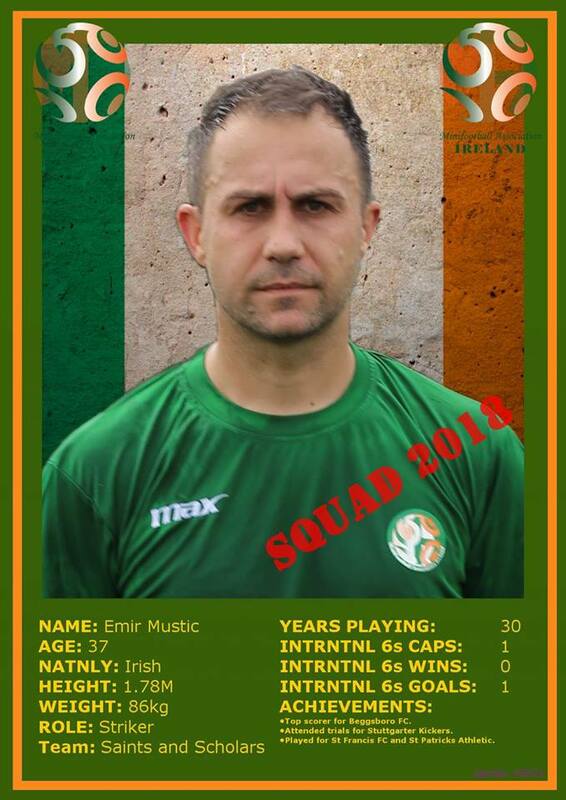 Emmet is the President of the Minifootball Association of Ireland (MAI), on the world committee for the Football 5s World Championships (F5WC), CEO for inter7s.com, the largest 7 a side league in Ireland, and developer of Socia Soccer, a ref-less form of minifootball that is growing internationally. Based in Dublin and Madrid, he is an educator in minifootball, socia sports and social entrepreneurship, teaching at the Real Madrid university in both Madrid and Bangkok. Along with numerous other projects including developing sports software, charity fund raising and heavy involvement in most of the international competing Irish men and women’s 5, 6 and 7 a side teams. Although interested in minifootball, Emmet promotes and pushes people to stay active in sport. He is aggressively working to increase participation in sport, with a new focus on the rapidly declining children and women in sport. You can learn more about Emmet’s leagues at www.inter7s.com and his work in the MAI at www.maireland.com.